What’s The Eight-Year-Old reading this week? Our mostly-weekly survey of the tidbits that cross The Eight-Year-Old’s desk. This week, The Eight-Year-Old discovers Harry Potter and Mommyo’s laissez faire attitude towards books is sorely tested. As parents, our attitude toward reading has always been a rather loose one: The more books you read, the less power any one book has over you. So we have typically let The Eight-Year-Old read pretty much whatever she wanted (with obvious exceptions — no adult fiction, unless it’s been prescreened). This typically works well for us because The Eight-Year-Old naturally gravitates towards kids’ books and non-fiction magazines about animals, science, and antiques. We had a few attitude bobbles while she was reading Diary of a Wimpy Kid, and every once in a while I question my choice to allow her to read National Geographic, but overall, The Eight-Year-Old is pretty good at self-censoring her reading choices. 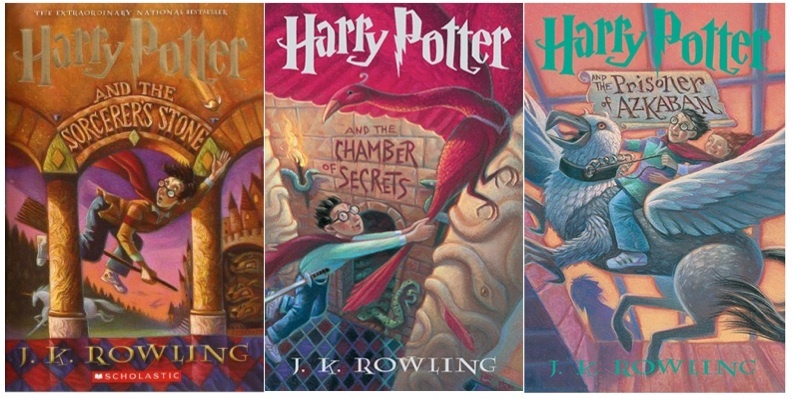 Inevitably, Harry Potter flew into The Eight-Year-Old’s life this week. The first two books were no problem. Aside from a scene crawling with giant spiders, there was very little in them that I thought she’d have trouble with. Harry Potter and the Prisoner of Azkaban is a different story. The Eight-Year-Old is not ready to deal with maniacal mass-murderers or Dementors. At best, they’d give her nightmares. Knowing my daughter, reading Harry Potter and the Prisoner of Azkaban too soon would turn her off one of the best children’s series I’ve ever read. After reading Harry Potter and the Sorcerer’s Stone and Harry Potter and the Chamber of Secrets in two breathless gulps, The Eight-Year-Old couldn’t wait to start Harry Potter and the Prisoner of Azkaban. And if she wanted to read it, our book parenting philosophy demanded that we let her. But knowing she wasn’t ready for it (and knowing that the remaining books become ever-more challenging as the series go on), could we in good conscience let her? Daddyo and I talked through various options: making her wait a year in between books, making her watch the movies as she reads each book (The Eight-Year-Old hates live-action movies, so this would be an effective stalling tactic), or doing nothing and letting her read the books at her own pace, like we would with any other children’s series. In the end, we decided to tell her about our concerns, but let her make her own decision about whether or not to read each book in the Harry Potter series. Yesterday, when I noticed The Eight-Year-Old rereading The Chamber of Secrets, I asked her how The Prisoner of Azkaban went. So it’s back on our shelf of purple books, ready to be enjoyed when The Eight-Year-Old is ready for it.